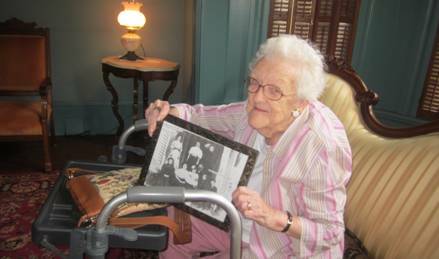 By admin on August 21, 2013 in "Constant Comment"
Mrs. Lusk Robinson, Sr. (Ruth) visited the Clayton House to see the magnificent fresco on the formal parlor ceiling; it was painted by her husband’s grandfather, Fritz Anders, in the 1880s for the Clayton family. Ruth and her son, Lusk Robinson, Jr. and daughter, Helen McDaniel, recounted the story of the German immigrant who jumped from a luxury liner he was working on when it landed in Boston harbor because he did not want to continue on to China. He was 14 at the time. Below, Mrs. Robinson holds a photo of Fritz Anders and his family on the front porch of their home on Sixth Street near the Claytons’ home, taken in 1907.